The purchase was absolutely hassle-free. Quick processing, good products. I will certainly come back with any further business. 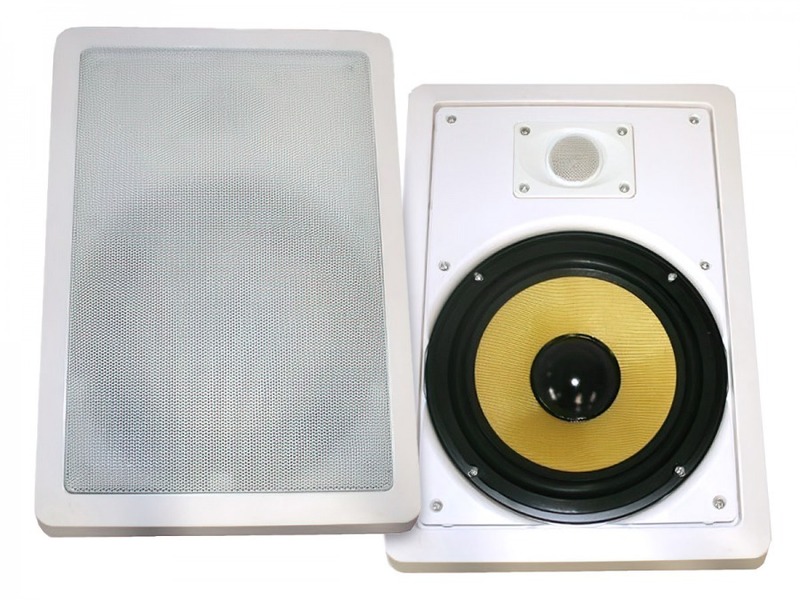 Square 8" Pair of 2-Way Wall / Ceiling Mounted Speakers - 150w Kevlar Drivers + FREE SHIPPING! Have you ever had one of those moments where it feels like you’re acting in a movie? Maybe you’re at home and it’s dark. You’ve just watched a scary movie when all of a sudden… the phone rings – cue the music. Or maybe your at home with the partner… the lights are dimmed, you're looking into each others eyes - cue the music. Perfect for those moments where ambient music would complete the scene, this pair of Square 8" Pair of 2-Way Wall / Ceiling Mounted Speakers are suitable for use in shops and offices, outdoors under the patio, or even as part of your home theatre surround system. With a cone constructed from rigid and light weight Woven Kevlar, the sound produced from these speakers is brilliant through low to high frequency ranges. With the tweeter sitting separate to the woofer a more dynamic response is achieved. Not to be looked past when updating your speaker system, these 8 inch by 2 way speakers are great for inconspicuous placement or where you are low on space whilst still emitting quality audio. Purchase this item with the protection of a 5 Year Cable Chick Warranty!! SHIPPING NOTE: Due to the size of these Speaker Stands Express Delivery may not be available to some locations, however quick delivery will still be provided via Couriers Please or Registered Post. Be sure to use the appropriate wire and cables when installing your in-wall/ in-ceiling speakers to prevent fire hazards. Firstly, let me say I have never heard of Cable Chick until the other day when I "googled" ceiling speakers and I visited the site "CableChick". The speakers on the site looked just what I wanted and after reading all the favorable reviews I had no hesitation in the purchase of a pair, along with 25 meters of speaker cable, all at a great price and to better this, free postage. Great service from this supplier as goods were shipped Monday and arrived 11.30am Tuesday. Speakers great and if they perform as good as they look I will be very happy. Not installed yet as house is under construction. Thanks Cable Chick, would highly recommend. Received the Round 8" In-Ceiling Speakers recently and the sound quality is excellent, although I should have shored up the ceiling space around them! These units replaced a couple of old 20 watt RMS speaker that couldn't cope and a there is real noticeable change even with the volume low. Couple of constructive criticisms though; I'm an electrician and I reckon you should also note the speakers RMS wattage (which is around 80). I've put up a lot of ceiling fans and the clamp arrangement on these speakers is the worst I have ever come across. Wouldn't clamp down on cement sheet, out door areas and didn't flip over properly. In saying this I would still purchase them again because of the sound quality alone and am thinking about getting more for the living room. Answer: "It is only possible to remove the grill, as the bezel and fascia are all one piece. The grill can be popped out using the tool that was included or with an unbent paper clip. Both can be cleaned with a damp cloth, being careful not to touch the driver." Answer: "The price is for 1 pair of speakers, ie: 1 x left and 1 x right channel speaker in one box." I just want to say how happy I was with my recent purchase of my HDMI to video composite converter. I received my product very quickly which made the entire experience a pleasure.